I DEPLANE INTO A COMMUTER terminal at DIA at 9 PM on a Saturday and there is pandemonium. The place is jammed. Really, the airport is jammed. I know semesters are ending and holidays are approaching but that’s not entirely it. More like what happens at the end of a war. 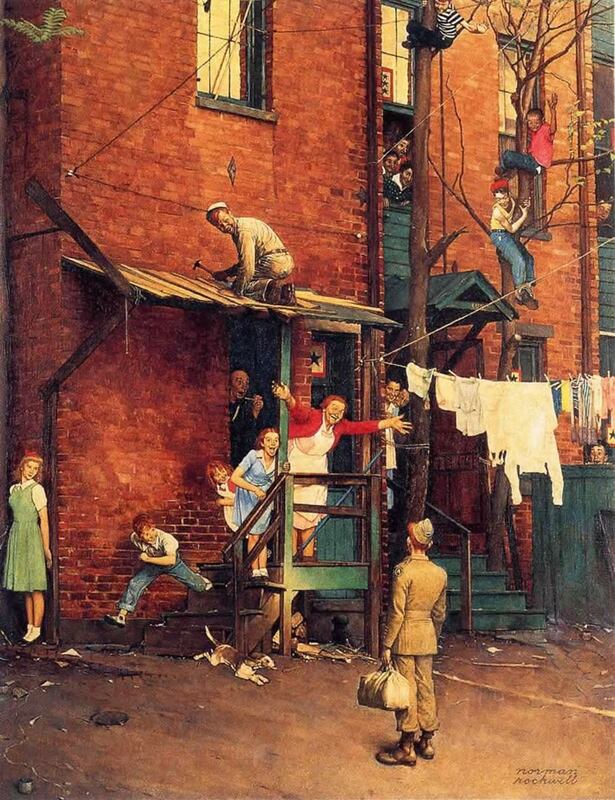 Norman Rockwell and The Saturday Evening Post capture this moment from another era in “The Homecoming.” The weary, bedraggled, young man standing there as his family explodes with joy. In their desert camo carrying huge packs effortlessly man and woman or disguised as civilians with very short haircuts they are everywhere. Most are searching for their next flight. Some are meeting family under the bigtop that is Denver’s main terminal building. I see the family members as I rise out of the underground on escalator. Waving signs. WELCOME HOME FRED. Looking just like the people in the image above. I stop for a moment and watch them when the soldier in question makes his appearance. THERE HE IS someone shouts and he turns seeing their signs huddled so close together they look as though they are a single being … an Aspen grove. For just a moment he stands there. No smile on his face. A few tears start running down his face as he realizes one part of his life is over and another is beginning. Then out of this collective leaps a young woman. Somehow she flies over the stainless steel barrier and is in his arms for an embrace that seems to have no end. Those young people still wandering around out in the commuter terminal waiting for their flights to little towns in Nebraska, Wyoming or Colorado will collide with their own family mass of waving arms, cheering, hugging, crying. These children who fight all wars — OUR children — are at last freed from fear of bombs and bullets; of redeployment (hopefully). They have come home. Returned to us from a fight that most Americans barely knew was going on except for the headlines on CNN or Fox News. But for the families receiving their children from this fight, the joy is no less than the moms and dads, aunts and uncles, brothers and sisters, sweethearts of another time. This entry was posted on Sunday, December 18th, 2011 at 11:07 pm	and is filed under Grumbles. You can follow any comments to this entry through the RSS 2.0 feed. You can leave a comment, or trackback from your own site.